Ever since a few years back when I tried the cookies and cream version of polvoron in the PI, I’ve been wanting to add crumbled up cookies and cream as an added ingredient in different recipes. Especially when I feel the combination would go well, either by color and/or taste. This is not polvoron but it does remind me of polvoron. I think what makes polvoron delicious is that it’s a cookie made with a milk powder that basically melts in your mouth, and so polvoron is a lot more delicate and lighter than these. This recipe works in both color and taste, I think. 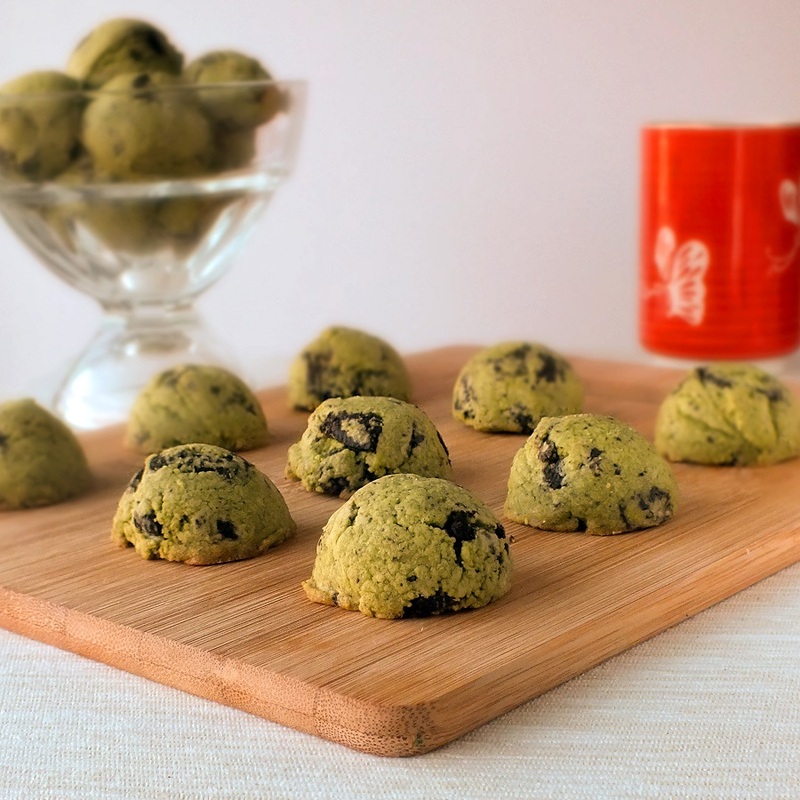 The matcha green tea taste goes well with the cookies and cream. 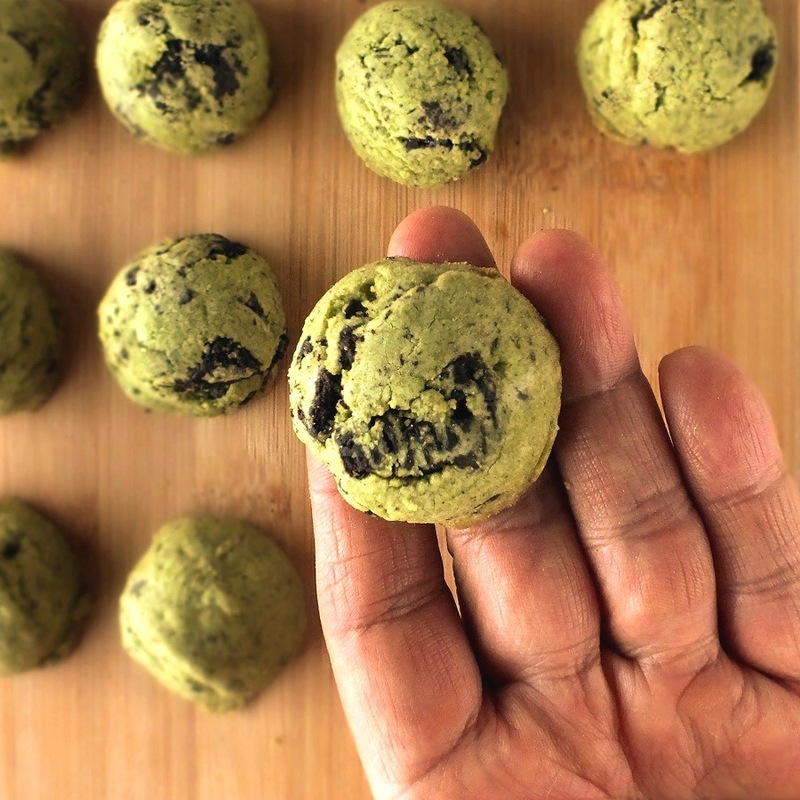 I used the recipe from Beyond Boulder that I used a few posts back to make green tea cookies. 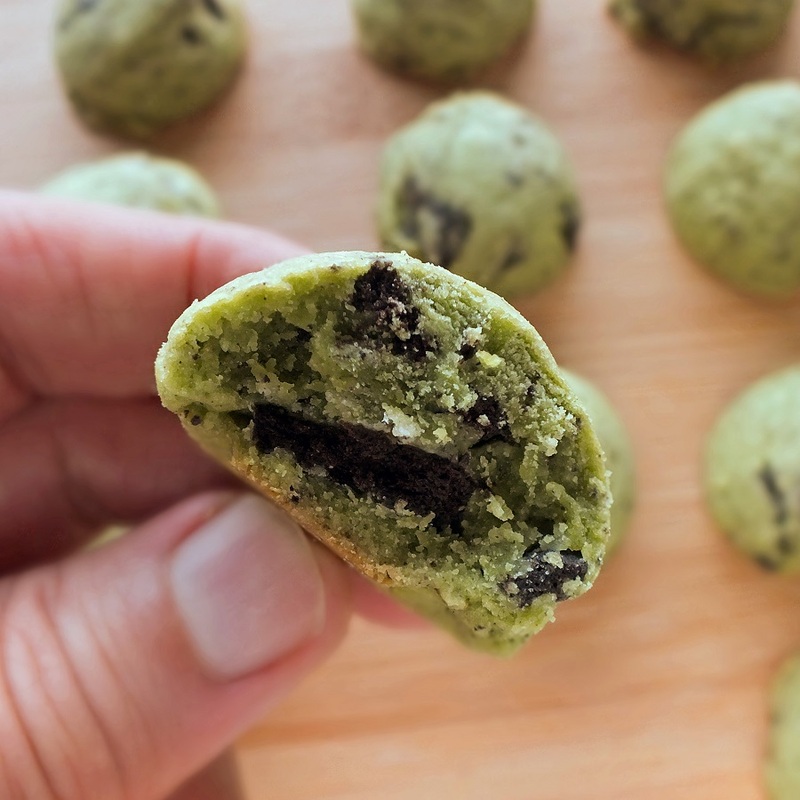 The minor differences I made, aside from the Oreos, was to use all-purpose flour instead of cake flour, to up the amount of matcha green tea powder, and to add a tablespoon of pure vanilla extract. I hope you enjoy! 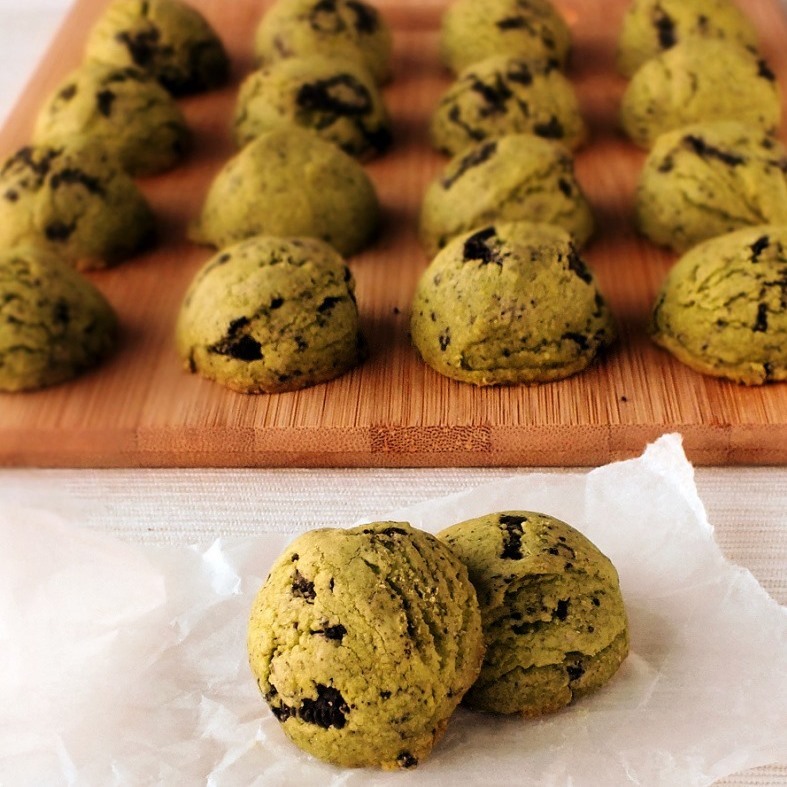 Cream the butter and sugar, then add the matcha until it is one color and creamy looking. Add the flour and Oreo cookies and while mixing add the vanilla a little at a time to moisten the dough. Dough should be fairly crumbly and not come together but moist enough to clump together when pressed. 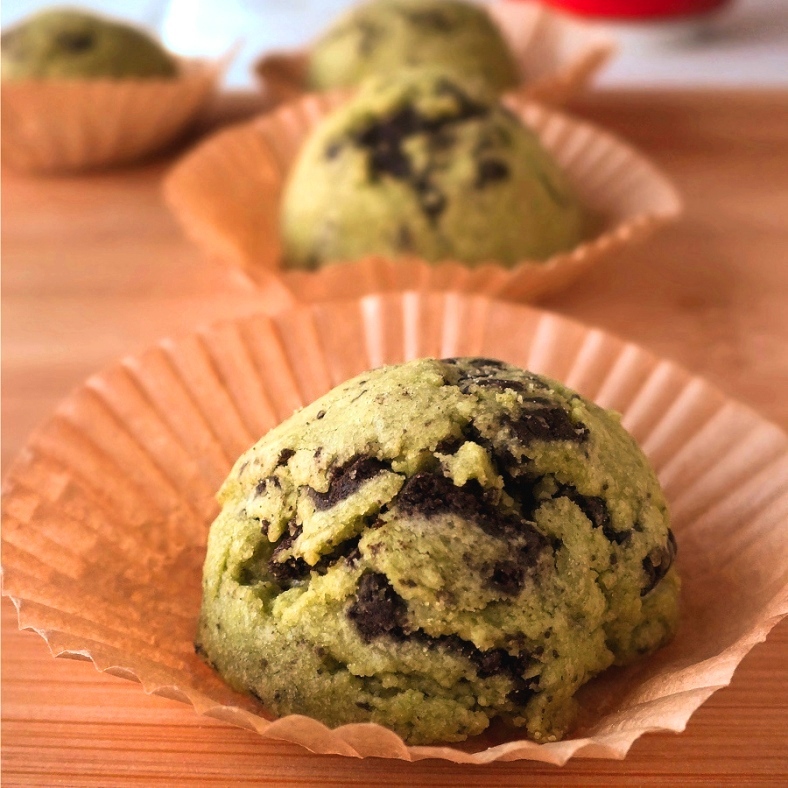 Do not over mix, but mix further if there are still areas of white flour that haven’t been colored by the matcha. Use either a tablespoon or a small ice cream scoop that is about the same size as a tablespoon and pack the dough into the scoop before turning each cookie out. Place cookies spaced out at least an inch between on a baking sheet lined with parchment paper. Bake for about 15 minutes at 325 degrees F. Cookies should be very slightly browned on the bottom and edges, and still a little soft. It will harden as it cools. Cool on wire rack. Makes about 28 cookies. This entry was posted in baked goods, baking, cookies, snack, tea, teacake and tagged cookies, cookies and cream, green tea, green tea cookies, matcha, matcha cookies, matcha cookies and cream cookies, matcha green tea, oreo cookies. Bookmark the permalink. These looks so good! I love them!